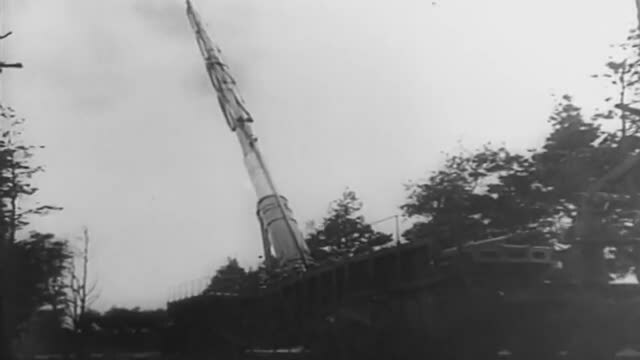 FR → Le canon lourd «Schwerer Gustav» (calibre de 800 mm) et le mortier lourd «Thor» (type 040 de 600 mm) de l'artillerie automotrice de la Wehrmacht assomment les défenses de Sébastopol. EN → Heavy canon "Schwerer Gustav" (800 mm calibre) and heavy mortar "Thor" (type 040 of 600 mm) of the self-propelled artillery of Wehrmacht stun the defenses of Sevastopol. DE → Zugkanone "Schwerer Gustav" (800-mm-Kanone) und Zugmorser "Thor" (Gerät 040 600 mm) der Wehrmacht betäuben die Verteidigung von Sewastopol. ES → El cañon pesado "Schwerer Gustav" (calibre de 800 mm) y el mortero pesado "Thor" (tipo 040 de 600 mm) de la artillería autopropulsada de la Wehrmacht paralizan las defensas de Sébastopol.